We are off to a rocking and rolling Spring Break around here. That is if you are 5 and don't know any different. Someday I won't be able to swing this, she will expect planned, organized fun because friends will begin to tell her about ski trips or beach trips that actually take place during Spring Break. I figure we have a few more years of blissful ignorance and I plan to milk that. In the future, a trip to the YMCA, HEB and the library is probably not going to rank very high on her cool-o-meter. Today it did, that's what matters. Last week or so I reached into my bag of Mom Ultimatums and told A. if she did not stop being wasteful with toilet paper and liquid soap I was going to take $$$ from her piggy bank to replace them. You would not believe the waterfall of tears and the begging that ensued. We agreed this was her last chance. Now we occasionally hear ,"Guess what?!?! I only used 3 squares!!" or, "I just squirted a little soap!!" She is really trying to be more careful which is good. Last night she couldn't find her almost new Carmex and had the nonchalant attitude of we'll just replace it. I reminded her again of keeping track of her things, etc. 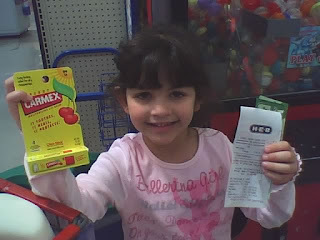 This morning I asked her for $1.25 from her stash so she could buy a new Carmex when we went to HEB. No tears, thank goodness, she was actually looking forward to it. I handed her her money and had her go through the check-out first. She was proud of herself. I don't know if this was really a lesson, but I hope she will keep track of this Carmex. As for the rest of Spring Break, well, we don't really have any plans. See, by keeping expectations low, anything can end up being fun. If you're 5.
especially after your trip to see the mouse recently!! I love the way you write!--so cute! I think it's a great way to teach your daughter ownership!--I'm sure she'll keep track of that carmex! P.S.--I am a huge carmex fan! I just think it's funny that you took your camera into HEB with you - what a great blogger you are! At age 41, I still often live by expecting little and what you get seems like so much! I hope the rest of your spring break is glorious! so true. :) man, i miss heb. especially at christmas when you can get those star cookies. ooh- and they have the cow cookies all year, i think. My kids never expect to do anything special for Spring Break, they think being out of school IS Spring Break. I've been having some conversations with the kids about being wasteful as well, but it has been more with things like leaving a large amount of butter on the knife after Landon slathers his bagel in the morning, or Whitney putting just washed clothes into the dirty clothes rather than putting them away. Aargh! Oh man, we struggle with the "just buy a new one" thing too. We also stuggle with "don't leave your chapstick in your pocket and put it in the laundy pile." My daughter unravels an entire roll of tp into the toilet every time she goes. Plunging is getting a little tiresome. My wrists are starting to hurt. When she is five, I will be using the piggy bank tactic for sure. good job!!! my parents taught me early waste not want not and I've never ever had debt in my life! Guess what? She found her original Carmex this morning. Oh well, now she has two and the knowledge that she paid for one of them.